08/31/18 By Gary M Baranec Tyrone's (3) Damon Gripp intercepts a pass meant for Central's Zach Parks during first quarter action Friday at Roaring Sprint Athletic Field. 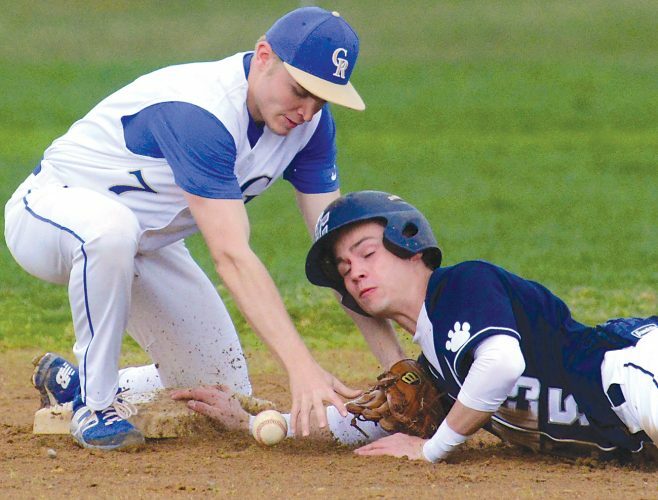 ROARING SPRING — Tyrone coach Jason Wilson had seen a performance like he got from defensive back Damon Gripp Friday night at Central’s Roaring Spring Athletic Field before. That was until Gripp surpassed Wilson’s older brother Jerry’s performance in a 2000 District 6 Class 2A semifinal victory over Westmont Hilltop with his fourth pick of the game, which he returned for a touchdown to cap the scoring in the Golden Eagles’ 33-13 triumph over the Scarlet Dragons. Gripp’s big game, along with a 200-yard rushing performance from Zac Albright, helped the Golden Eagles knock off Central, which beat Tyrone twice last year, including in the playoffs. Central struggled to run the ball, rushing for just 68 yards on 27 carries as a team, and was forced to throw it 42 times. Tyrone lost its opener in overtime a year ago and never recovered during a 3-8 campaign. The Golden Eagles are hoping a 2-0 start to this year will lead to momentum they can carry throughout this season. Light opened the scoring by finding Tommy Hicks on a 35-yard touchdown pass on a drive set up by a Gripp interception. Albright followed that with a 54-yard jaunt into the end zone to make it 14-0. Gripp seemed to snuff out any possible Central momentum with an interception late in the first half, but Thad Albright picked off a pass of his own for the Scarlet Dragons on the next play then caught an 8-yard scoring pass from Noah Muthler to pull within one score. Just before Central was to receive to second-half kickoff, lightning streaked across the sky and put the game into an hour and a half delay. At just after 10 p.m., the second half finally began, and Tyrone quickly regained the momentum when Light ran 45 yards to set up a 4-yard touchdown run. 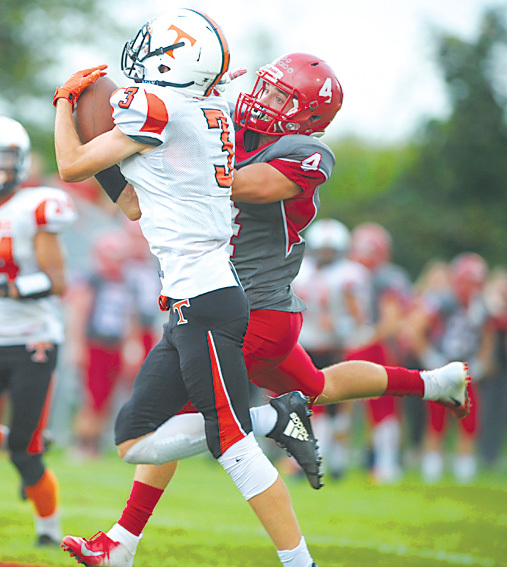 Brandon Homan and Light hooked up for a 26-yard score on Tyrone’s next possession, but Muthler scored from 2 yards out early in the fourth quarter to bring Central within 13 points. The Scarlet Dragons got the ball back and made it to the Tyrone 35, but Muthler’s 40th pass of the night fell incomplete on fourth down to all but end the game. Gripp’s fourth interception came with 1:25 to play, and he returned it 45 yards to set the final score. T–Hicks 35 pass from Light (Raabe kick), 3:31. T–Z. Albright 54 run (Raabe kick), 2:42. C–T. Albright 8 pass from Muthler (Keith kick), 0:33. T–Light 4 run (kick failed), 8:05. T–Homan 26 pass from Light (pass failed), 4:50. C–Muthler 2 run (kick failed), 10:46. T–Gripp 45 interception return (Raabe kick), 1:25. RUSHING–Tyrone, Z. Albright 26-200, Light 7-47, Zimmerman 2-8, Lucas 2-1, TEAM 4-(-16). Central, Muthler 12-30, Marko 3-15, Imler 5-11, Quarello 3-7, Walters 2-5, Parks 1-1, Kurtz 1-(-1). PASSING–Tyrone, Light 4-11-1-83, Lucas 0-2-0-0. Central, Muthler 18-42-4-180. RECEIVING–Tyrone, Hicks 1-35, Homan 1-26, Lehman 1-15, Gripp 1-7. Central, T. Albright 8-79, Parks 4-55, Kitt 2-26, Walters 1-12, Kurtz 1-5, Quarello 1-3, Marko 1-0.